Pre-Pay and Save BIG ! "Your Vacation Begins With Us"
Your Vacation Begins With Us ! 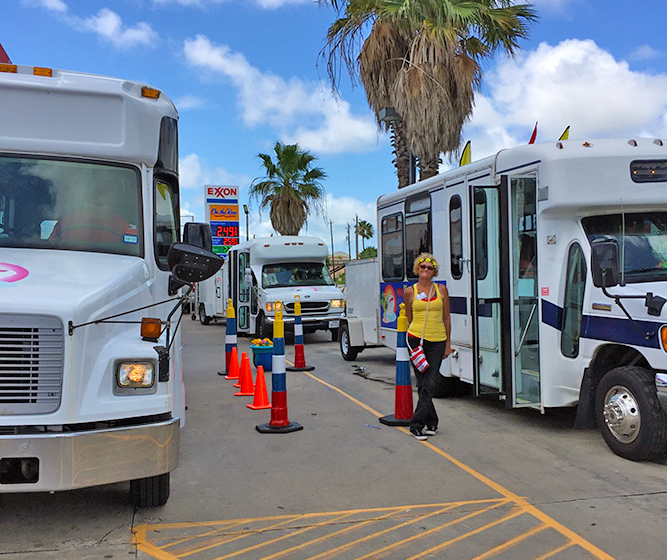 We have FREE Shuttles with drop-off and pick-up at the Port Terminals every 15 minutes. This includes FREE shuttle service for passengers and their luggage both to and from the Port of Galveston Terminals. No worries when it comes to lugging your luggage! We take your entire group AND luggage. That means no need to drop bags at terminal. We load and unload luggage for you – from car to shuttle and back again. No need to worry about your car while on vacation. We provide secured parking with cameras and an attendant every day of the week. Convenient fuel pumps and Exxon store on site. The property is elevated with good drainage. Get affordable full service cruise parking for Port of Galveston cruise passengers sailing on Carnival, Royal Caribbean, and Disney Cruise lines! EXCEPTIONAL SERVICE! Awesome service with a dedicated smile! I used this company to store my rented vehicle before an 8-night cruise out of the Port of Galveston. These guys are quick, organized and professional. My wait on both ends was less than 2 mins!! Though my interactions were brief, both on departure and return, I was so pleased I tipped double! We used this parking service AGAIN this year for our 7 day cruise! Again this year, they were more than happy to help, they were all kind, and polite! Waited about 10 minutes in each direction for the shuttle to leave, and we were able to completely avoid the crazy port traffic!!! We will definitely use them again!